Adorable rag doll in a white floral trim dress with a sweet applique bunny on the skirt front and delightful daisy on the chest. Simply adorable for a little girl, which she in turn will adore for years to come. The perfect gift for a newborn or a new big sister. Some toys are truly timeless, and these beautiful rag dolls from Powell Craft are certainly one of them. With great attention to detail these handcrafted ragdolls make the perfect gift. 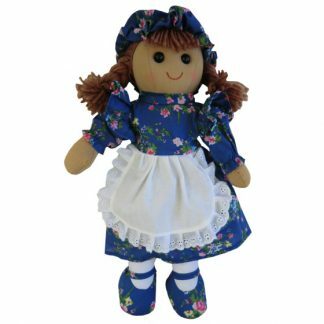 This model comes with auburn brown hair and a pretty dress decorated in beautiful roses, and at an impressive 40cm in height this cheerful rag doll is sure to be an instant favourite!